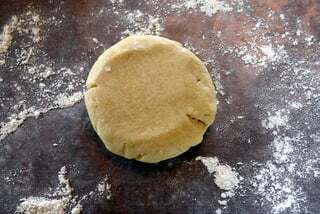 This is my quick and easy recipe for sweet empanada dough. 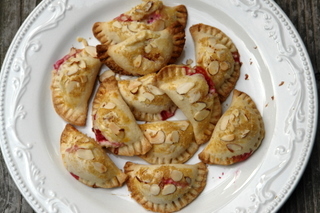 This recipe for easy pastry dough for dessert empanadas or sweet turnovers/hand pies is very similar to a pastry dough that you would use for sweet tarts or pies. You can adjust the amount of sugar based on your preference, but keep in the mind that more sugar you add to the sweet empanada dough, the more fragile it will be and will be more difficult to roll out. I recommend starting with the lower amount of sugar, especially if it’s your first time making sweet empanadas. 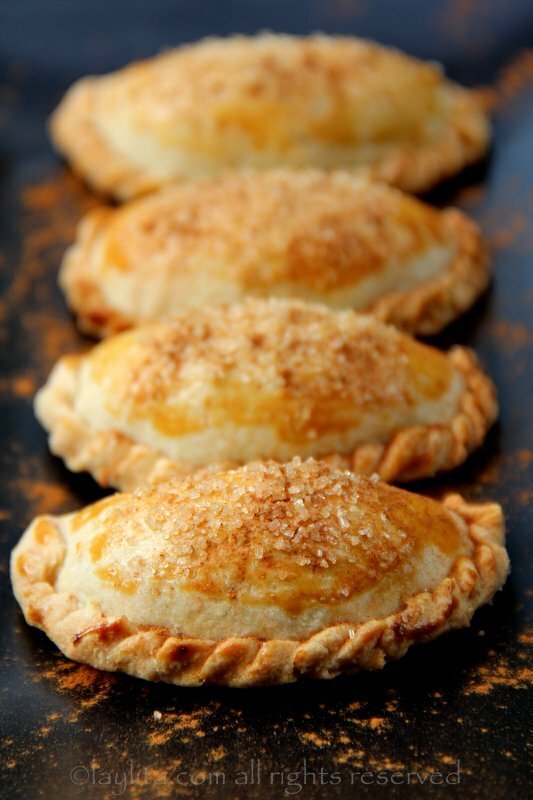 In addition, I usually sprinkle sugar on top of dessert empanadas, so they will get an additional touch of sweetness. You can easily customize this sweet empanada dough by adding spices, like ground cinnamon/clove/all spice or anise seeds. You can also make the empanadas into different shapes, using large molds/cookie cutters, such as hearts, ovals, etc. Easy recipe for sweet empanada dough or how to make sweet pastry dough for dessert empanadas or hand pies/turnovers using a food processor. Add the butter, eggs and water until a clumpy dough forms. 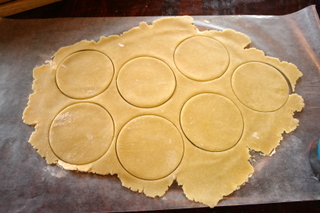 Roll out the dough into a thin sheet and cut out round disc shapes for empanadas, use round molds or a small plate or cup as a mold, you can choose how large based on whether you want small or medium sized empanadas . Use the empanada discs immediately or store in the refrigerator or freezer to use later. To assemble these sweet empanadas or dessert turnovers, place the filling of your choice on the center of each empanada disc. 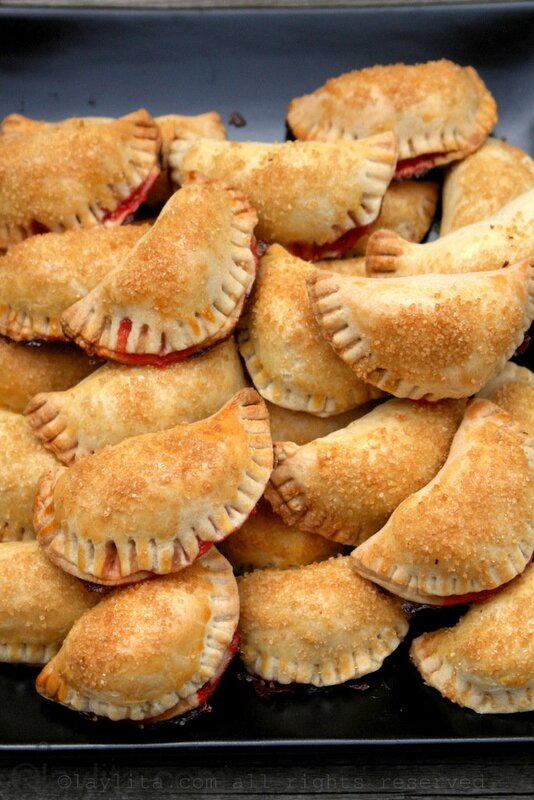 Don’t add too much filling since it makes it harder to close or seal the empanadas when they’re overstuffed. To seal the empanadas, fold the disc and seal the edges by pressing the dough with your fingers. 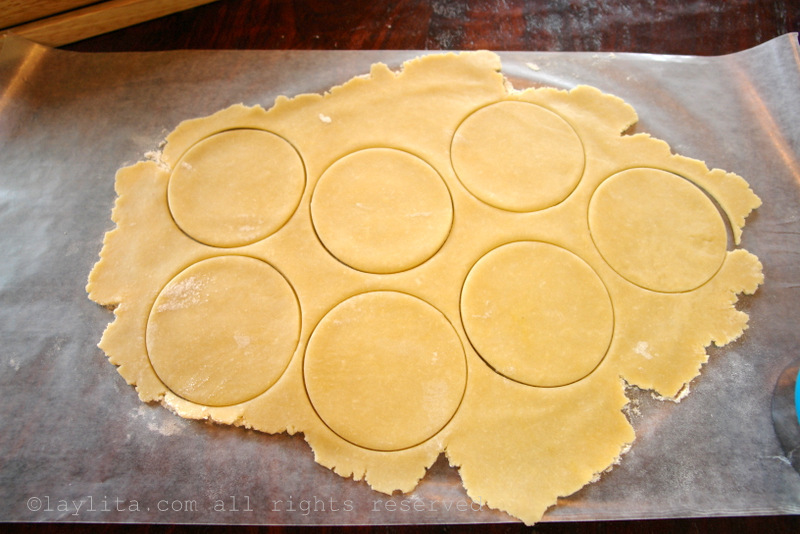 If needed, you can brush the inside edges with egg white, it will act as a glue for the empanadas. You can do a final seal by pressing the top of a fork against the edges. You can also try a curl type seal, called repulgue or churito, by using your fingers to twist the curl the edges – this is harder with sweet empanadas than with regular savory empanada dough. For best results, refrigerate the empanadas for at least 30 minutes before baking – this also helps them seal better and prevents the filling from leaking out. If you want your empanadas to have a nice golden finish, then you can brush them with egg wash (a whole egg whisked or egg yolk plus a few drops of water whisked). 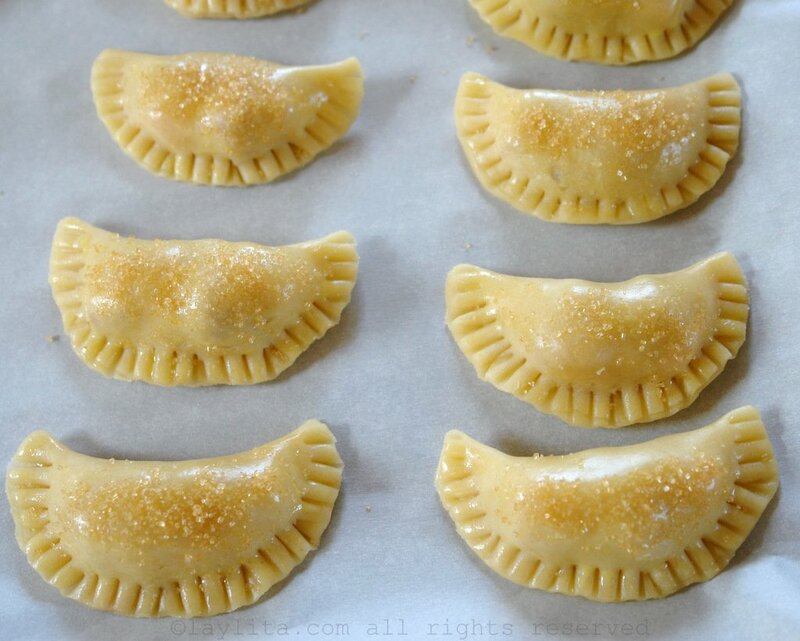 After brushing the empanadas with egg wash, you can sprinkle sugar (I prefer brown sugar or demerara) on top. 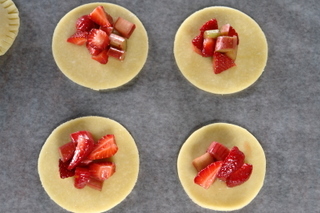 You can also sprinkle them with regular or powdered sugar after baking. 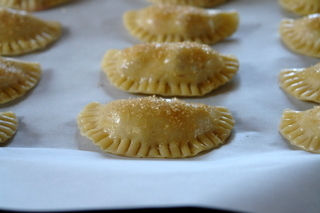 Bake the empanadas in a pre-heated oven. I usually bake them at 375F/190C. The baking time will vary based on the oven and size of empanadas, and should be in the range of 18-25 minutes – the empanadas will be ready once they are golden on top. Love these things. I fill them with chocolate. Laylita thank you for making these resipes available. 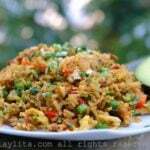 My wife is from Guayaquil, and I absolutely love the food there. Your website is definitely my favorite recipe site on the internet. Empanadas de queso are my favorite, and I’m wondering, what kind of cheese would you use here in the states? I love the cheese in Ecuador, the bricks :) but I can’t find that here. I would love to make empanadas, but I want to make sure I use the right cheese. Hi Joseph – I usually use mozzarella, if I have some good queso fresco I’ll mix in with the mozzarella. I have found some local cheesemakers that sell cheese at the farmers markets that have a fresh cheese that’s very similar to the Ecuador one, but the prices are high so it’s more for special occasions. Even the queso fresco I like is one that is made in Oregon, called Froylan, and is one of the better ones I’ve had in the US. Ecuadorian cheese is made with raw milk so that’s also why it’s hard to find anything with a similar taste here. I was trying to revamp sweet potatos and made the dough with Coconut & Rice flour for my gluten-free amigas. I had to double the water and– in hind sight– should have added a scoop of the campote to the dough for pliability… but they tasted great and my friends were so happy to have a baked goods that were wheat-free. 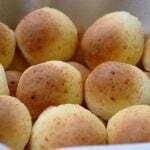 I brushed the tops with butter & sprinkled with brown sugar and baked them at 350 degrees. DELICIOSO!! Mil gracias por la receta chica!!! I’ve never really baked anything – I love to cook but I barely ever venture into anything that might require making dough and rolling out dough. I live in a tiny studio apartment with a very small kitchen and I set out to make Thanksgiving empanadas yesterday. I used your recipe (sans food processor!) and it came out so great!! I’ve never made dough so I was scared it wouldn’t work out for me but it came together nicely. I added a sweet potato, onion, and goat cheese filling to the empanadas. My only issue is that two of the empanadas opened up in the oven a little bit…I think they had too much filling inside them?? More egg whites solve this problem?? Muchas gracias por la receta! Riquisimo. I will try this recipe soon! Sounds delicious and easy to make! One question though, is the butter we need to use salted or unsalted? I typically use unsalted butter. Found the video on the “repulgue” technique to seal the empanadas in a neat and pretty way. That is on Rebecca With Love from Argentina site. Somewhere in my search for “how to make empanadas” the suggestion was made to look there and it sure was there. These were delicious! Made them for a school spanish assignment! Thank you so much! My new favorite Christmas cookie!!! I was looking for a recipe for spanish class when I came across this. I think it looks good, and I think might make it for my project. I think that my dad might like it also.